Mr. T, the character originated from the A-Team live action show in the 1980's. He has been seen in numerous movies and TV shows. At the height of his fame on A-Team, Mr. T joined the rank of other action heroes such as Chuck Norris, and Rambo. Ruby-Spears created the Mister T television series (They spelled out the word "Mister"). The show aired on NBC for 2 seasons, a total of 30 episodes, from 1983 to 1984. 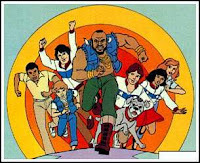 In the cartoon Mr. T was the owner of a gym and trained a group of gymnasts. Together they traveled the world solving mysteries Scooby Doo style. Like many of the cartoons in this time period, there was a message embedded for kids. 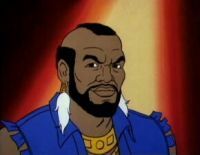 The beginning and ending of each episode featured a live-action short of Mr T. himself. In the beginning he would explain what was going on and in the ending he would share the intended moral lesson of the episode. One of the notably funny things about the show was that he had a dog who also had his signature mohawk.